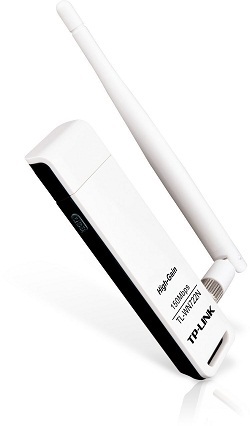 The TP Link high gain wireless USB adapter is easy to install and use. The wireless USB adapter provides N speed of up to 150Mbps for fast data transfer. Thanks to its Quick Security Setup, a wireless encryption can be established with just a simple push of the QSS button that is featured on this product. This device is capable of supporting 64/128 WEP, WPA /WPA2/WPA-PSK/WPA2-PSK (TKIP/AES) as well as IEEE 802.1X. Be it browsing on your system or playing games on specialised machines, with this device the job becomes convenient and quick. The TP Link wireless USB adapter comes with a high gain external antenna that is also detachable from the device. The adapter supports infrastructure and ad-hoc modes, while being compatible with Windows 2000, Windows XP 32/64bit, Vista 32/64bit, and 7 32/64bit. This high gain wireless USB adapter also lets you work with Sony PSP X-Link for Windows XP to offer you an exciting gaming experience. This wireless USB adapter works seamlessly with 802.11n/b/g products. Boasting ample flexibility and compatibility with multiple devices, this adapter is a smart option to have in your office or home.